Apple competes against other companies; that's a part of doing business. But today, more than ever before, Apple faces increasing—and fascinating—competition from companies that aim to recreate and then build on Apple's own innovations. Apple's responses to those competitors and the products they create are even more interesting. In 2007, Apple introduced the original iPhone. There was nothing like it in the marketplace: a multi-touch screen that took up almost the entire face of the device, a user interface based on discrete apps. The competition responded, at first, by trying to recreate the iPhone. “We too can make phones that uses full-size screens with apps,” the competitors seemed to say. But those competitors—and their customers—initially found that simple iPhone knockoffs weren’t very exciting. Part of the problem was that, as late CEO Steve Jobs promised and as Samsung has found out all too well, Apple had “patented the hell out of it.” Perhaps even more significantly, simply copying the iPhone wasn’t such a simple or straightforward task; even today, some competitive platforms struggle to do smooth scrolling and zooming. Once Apple’s competitors realized that creating another version of the iPhone wasn’t enough, they took what to them must have seemed the next logical competitive step: They made the screens bigger. They made phones with screens that hit the four-inch mark, then the five-inch mark; the Samsung Galaxy Note II includes a 5.55-inch screen so large that it ships with a stylus—human fingers simply aren’t long enough. For many years, Apple ignored such competition. The company remained convinced that the original iPhone’s 3.5-inch screen was sufficient and stuck with what it knew; it didn’t get sucked into the screen-size race. When Apple finally did embrace a larger screen size with the iPhone 5, it didn’t follow directly in its competitors’ footsteps. Rather, it implemented the new phone’s larger screen in a way that clung to the original iPhone’s design goal of being usable with one hand. By stretching the iPhone’s screen size vertically, and leaving the width unchanged, Apple added screen real estate in its own way, without mimicking its competitors. The iPad and its competitors, interestingly enough, followed a nearly perfectly mirrored path: Apple unveiled the iPad, competitors released knockoff tablets that failed to gain traction, then the competitors started playing around with screen size. Amazon and Google in particular found success by making tablets that weren’t shot-for-shot remakes of the iPad, but rather were smaller devices with 7-inch screens, unique in their own right. And what happened? For a time, Apple ignored the smaller tablet size; Steve Jobs, of course, said that 7-inch tablets weren’t “sufficient to create great tablet apps.” When the company unveiled the iPad mini, it did finally introduce a smaller iPad—but still eschewed duplicating what its competitors had done. The mini's screen is just shy of 8 inches diagonally, probably in large part so that scaled-down apps built for the original iPad would remain large enough to be sufficiently tappable, without sacrificing too much on the pixel density front. It’s worth noting that when Apple responded to the iPad’s undersized competitors, the company didn’t feel compelled to compete on price. Anyone who’s followed Apple for any amount of time can’t have been too surprised by that decision. Though Apple stunned many when the original iPad’s price tag came in at the relatively low $499 mark, Apple—like Jaguar and Tiffany’s—has never seen fit to compete directly on price. 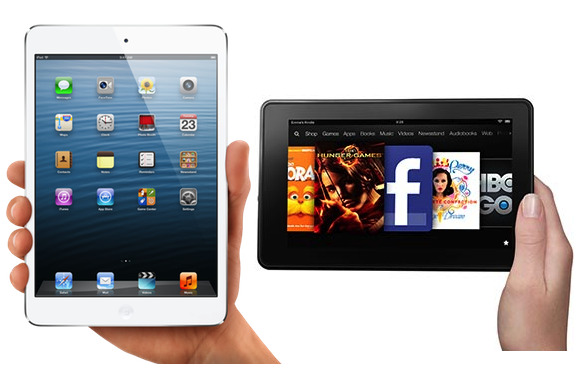 The iPad mini is $329, while the Kindle Fire costs $159 and the Google Nexus 7 starts at $199. This is a new phase in Apple’s competitive picture, though. Apple never got caught up in the megahertz or megapixel race, struggling artificially to match every move its competitors made. Instead, the company pushed the idea that the value of its products couldn't be measured by such specs. The difference now is this: When Apple’s competitors responded to the original Bondi blue iMac, they added blue plastic inserts to their PCs—and then they stopped. Today, Apple faces a more nimble and wealthier cadre of competitors who might start with a similar knockoff approach, but then keep iterating on it. So it’s interesting to see Apple’s product plans being influenced by competitors who are in turn taking their own spins on Apple’s innovations. Larger phones, smaller tablets: Both were introduced to take bites from Apple’s market share. And then both were implemented by Apple itself, but in that company's own way.